The Horsehead Nebula, a dark molecular cloud known as Barnard 33 seen silhouetted against the bright emission nebula IC 434. Image: J.-C. Cuillandre, Canada-France-Hawaii Telescope: http://www.cfht.hawaii.edu/. Figure: CO dark gas. This shows a highly resolved section of a galaxy simulation. The greyscale shows where there is molecular hydrogen and the purple where we would see CO emission. There is considerable amounts of gas which is CO dark and we would not see directly in observations. Models of astrochemistry, which are used to predict and explain observed abundances of molecules in a variety of astrophysical sources, contain hundreds of atomic and molecular species and thousands of reactions describing their chemistry. We are developers and hosts of the UMIST Database for Astrochemistry (www.udfa.net), a mature, well-used and popular source of chemical kinetic reaction data for this purpose. Through this project we are involved in the Virtual Atomic and Molecular Data Centre (VAMDC) at data provider and technical board level. We host and maintain spectrafactory (www.spectrafactory.net), a database of molecular template spectra and we are founder members of splatalogue (www.splatalogue.net), a large compilation of transition-resolved spectral line data for astrophysical spectroscopy. Splatalogue is integrated in the ALMA project as well as freely available in its own right. 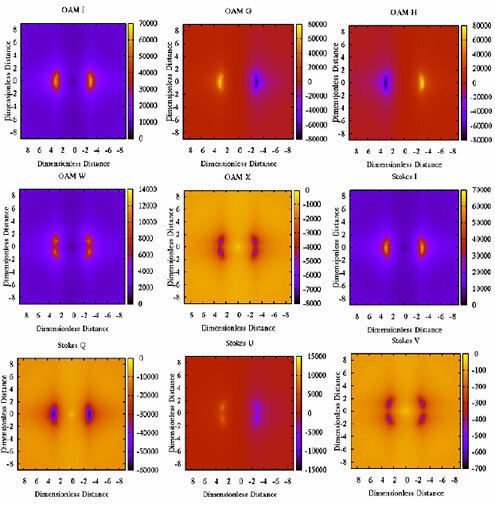 Using chemical models tied to simulations we can predict the emission from species such as CO, which is one of the main molecular species observed by ALMA and is used to detect molecular gas. Using such models we can directly compare simulations and observations to test our understanding of star formation. We can also use the models to predict where there may be "dark" molecular gas that does not emit in CO and is hence invisible to our telescopes in this wavelength. It is well-known that photons of radiation possess spin orbital angular momentum (SAM), and that net SAM manifests itself observationally as polarization. It is much less well known that radiation can also carry photon orbital angular momentum (POAM), and that this can in principle be observed through, for example, the measurement of azimuthal electric field correlations. A detection method for radio telescopes, that avoids the need for new detectors, is to place a device, such as a q-plate or spiral phase plate, in front of the receiver horn. The device converts POAM into SAM that can then be detected by a standard polarization-sensitive receiver. Radiation with POAM has a number of unusual characteristics: wavefronts are helical, rather than plane, so there are one or more phase discontinuities in any plane cut perpendicular to the propagation direction. The Poynting vector of the radiation is not instantaneously parallel to the propagation direction, but is only so averaged over a wave period. Consequently, there is a component of the electric field in the propagation direction. While net polarization can be generated in media that are optically anisotropic (but may still be homogeneous), the generation of POAM requires media that are optically inhomogeneous. Possible sources in astrophysics include turbulent plasmas, non-uniform magnetic fields and gravitational lensing of radiation. The figure shows Stokes and POAM-sensitive parameters resulting from OH maser amplification through a magnetic field of ideal quadrupole type, oriented perpendicular to the propagation direction. More realistic magnetic fields would generate a far lower fraction of POAM. The figure shows Stokes and POAM-sensitive parameters resulting from OH maser amplification through a magnetic field of ideal quadrupole type, oriented perpendicular to the propagation direction. More realistic magnetic fields would generate a far lower fraction of POAM. The compact nature of maser beaming and amplification means that they can be measured using radio interferometry with higher spatial and velocity precision than is possible for ordinary thermal emission. Imaging the winds from young or old stars at a resolution of a few au or better means that clumps and regions of gas sharing the same physical conditions can be separated. Individual maser species provide highly-detailed spatial and kinematic information, but the exponential nature of amplification means that it is hard to deduce physical conditions from a single line. In recent years, it has become possible to observe multiple transitions of the same molecule and obtain far more accurate models. This has provided a chronometer for star formation. Polarised synchrotron emission at 30 GHz as seen by Planck and WMAP. Large loops and spurs can be seen (contiguous regions of colours). Spectrum of G160.26-18.62, a Galactic cloud in the Perseus molecular complex. 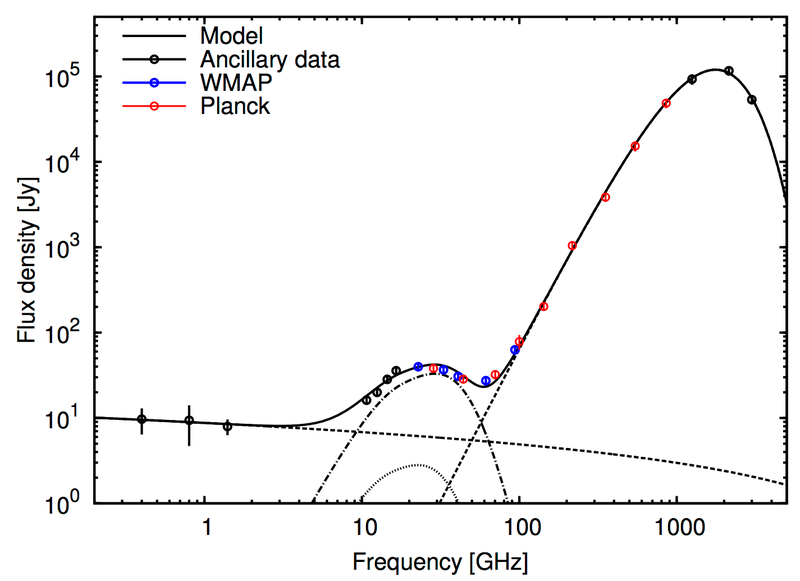 Data have been combined from low frequency radio, WMAP, and Planck data. The various lines show different components of the emission - free-free emission dominates at low frequencies, thermal dust at high frequencies. At intermediate frequencies (~30 GHz), models of spinning dust emission are a good fit to the data. 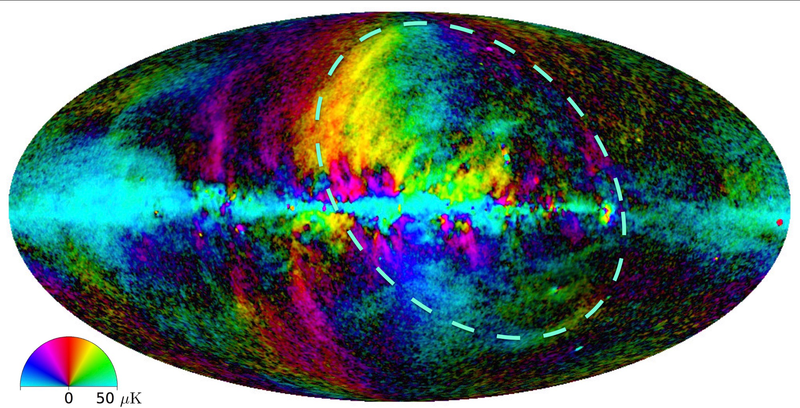 Measurements of the Cosmic Microwave Background on large scales are significantly contaminated by emission from the interstellar medium of the Milky Way. In intensity, this emission comes from electrons spiralling around magnetic field lines (synchrotron emission) or scattering off positive ions (free-free emission), as well as emission from dust particles, both thermally as greybody emission and through spinning dust emission. In polarisation, most of the emission is from synchrotron emission and thermal dust emission. A new component of diffuse emission was identified in the late 1990s but its origin was unknown - it was termed "Anomalous Microwave Emission", or "AME". Since then, JBCA has played a major role in characterising and identifying the source of AME. Data from the Planck satellite has ben crucial in measuring AME. 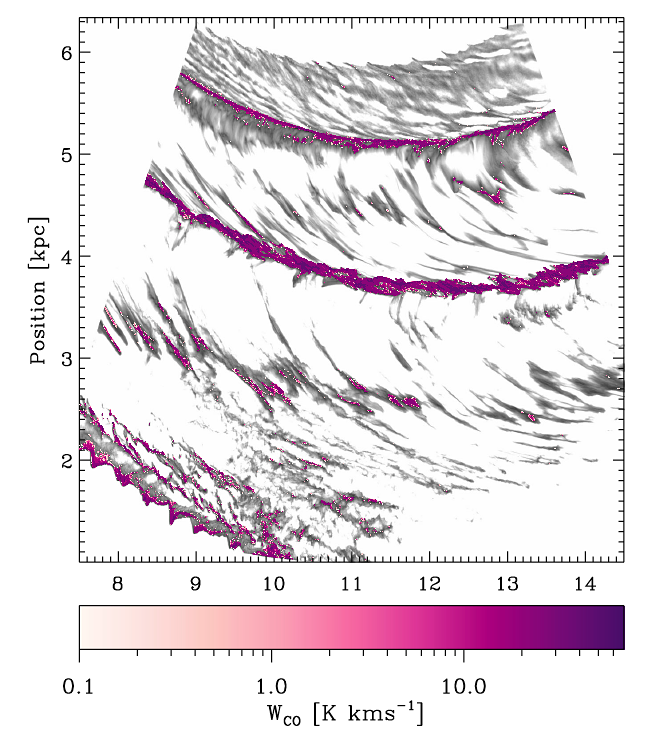 In 2011, a team led by Clive Dickinson, showed definitive evidence for spinning dust grains as the major source of AME from the Perseus cloud (see Figure). If spinning dust is ubiquitous, it can be used as a probe of the environment in the interstellar medium. This fly-through takes the observer on a journey into the famous constellation of Orion, to visit the iconic Horsehead Nebula and its fascinating environment.